We provide our clients with supreme quality of control panels at really competitive rates. We also provide customized panels to our clients as per their project requirements. As a recognized name in the industry, we are providing Solar Panel Designing Services. To render these services, our professionals make use of cutting-edge technology and advanced tools keeping in mind the international norms. Assisted by our dexterous engineers, we undertake the entire planning and organizing process of material handling, and assembling. Test cell services such as water supply with temperature controller, fuel temperature controller & handling, exhaust handling, In cell transducer panel design, swing arm / boom design are provided. We manufacture, install and commission control panels of the highest quality for a variety of indoor and outdoor industrial applications. 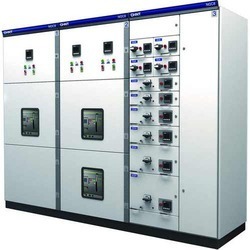 We do PLC control panel design and also doing PLC programming . Below are the images of panels. We make it square or rectangle as per customer requirement. It has importance in making MANDAPS and setups like film or serial setups. Designing of cubicles for control system components and wiring schemes based on space, aesthetics and ease of maintenance. We Design and build Panel board for Elevator and pharma machine since three years. According to customer requirement we build panel and give technical support.